Having had so much for dinner last night, only a cup of coffee was taken for breakfast, and just a couple of bread rolls as I packed. Getting away about 0830, an emoliente was enjoyed kerbside. The road up to the highway was incredibly steep, it was ridden, as I was fully rested. A good sweat was upon me by the time I had reached the highway, 1km. Once there, though still climbing, the gradient was very forgiving. Thinking about what I had written early this morning and feeling very strongly about one or two things left unsaid. Finding an internet cafe a few km up the road, a couple of additions were made to my comments. In particular, the fact that most consumers in Australia, almost have no choice when it comes to purchasing their food. Woolworths and Coles, have successfully got most of the population in the country acting like sheople. A flock tended only for their own interests. Whilst in Coffs for a few months last year, at the Toormina shopping centre there are both Coles and Woolworths. On checking the price of bananas at both stores. They both had them priced at $1.88c /kg, you call that competition, the only competition they are involved in is how they both can rip off their suppliers and the consuming public. Their glossy newspaper inserts advertise all the food that is garbage, ice cream, sodas, cakes with a couple of staples. Though, once in the store all the necessities are always expensive. By the way, the independent fruiterer outside in the carpark had bananas for $1.40c/kg. The carbon footprint of most of their products, especially, so called fresh food is huge. The only good to come from this situation, is the high probability people have of bumping into someone they havent’t seen for awhile, as almost everyone has to visit these monopolistic establishments at some time. It is such a refreshing experience buying food here, from markets, street stalls and little tiendas. Though there are big supermarkets in the larger cities. One still has the option to buy everything at markets. The multi nationals, hold their price, e.g. Nestlé products cost the same here as in Australia or NZ. 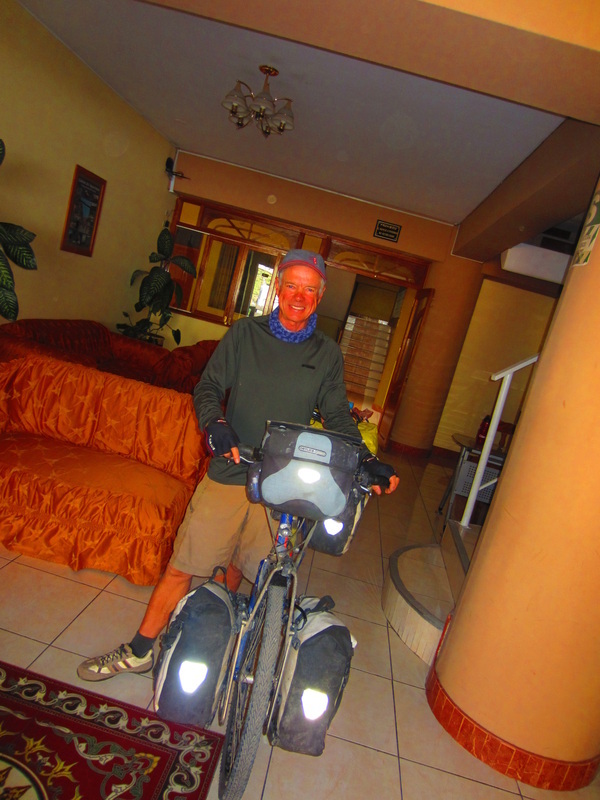 Riding on, the road was mainly shared with semis and tourist buses heading to and from Cuzco. Most tooting at me, these gestures are so positive and keep one moving. Melon and mandarins were enjoyed off the backup of a pickup. Another guy further up gave me a few tips on speaking Quechua. “emen su tiki” what is your name. I think! The view back down to Abancay was always off to my right. The town got smaller and smaller as the climb increased. The gradient, really was great, at times almost level. Snow was on the range above town. At about 30km up, some coca leaves were chewed, riding became a bit easier. Placebo affect, or not, the numbness in the mouth and jaw is always a different sensation. The temperature was still quite comfortable near the top, some 3900m. As usual when the tele towers can be seen, one can get a bit hopeful. Reaching the top, 38km had been logged. Once again, it was so rewarding when the pedals don’t need to be revolved. About 4km down, the obligatory clothing change was made. A further few km on, a viewing area was seen, here bread and tuna with squeezed lemon and Tabasco were enjoyed in the afternoon sun. The site offered brilliant vistas of the Andes proper, rugged huge mountains, covered in snow, broken by imposing dark outcrops of rock. One could picture Condors aloft on updrafts and thermals above the vista. Their home. 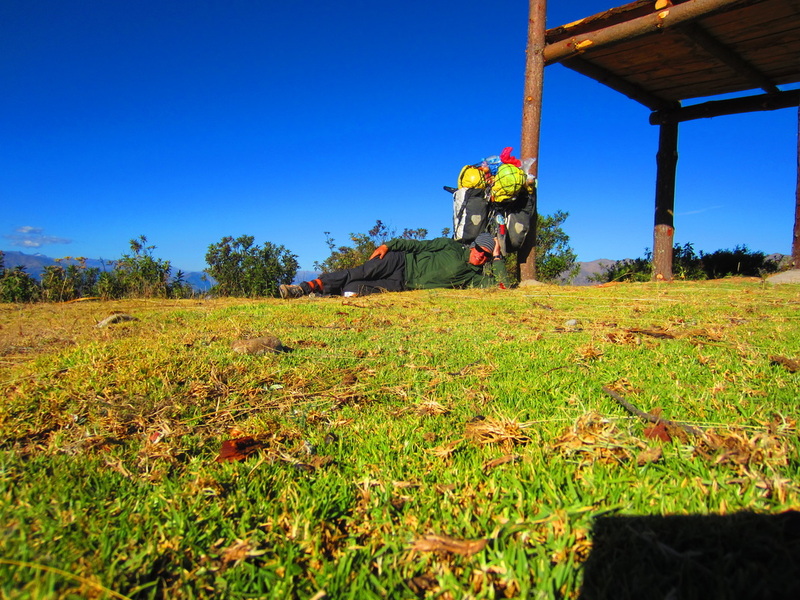 It was going to be an easy run to Caruhuasi, so time was enjoyed, just soaking up the warmth of the sun, whilst lying on the grass. 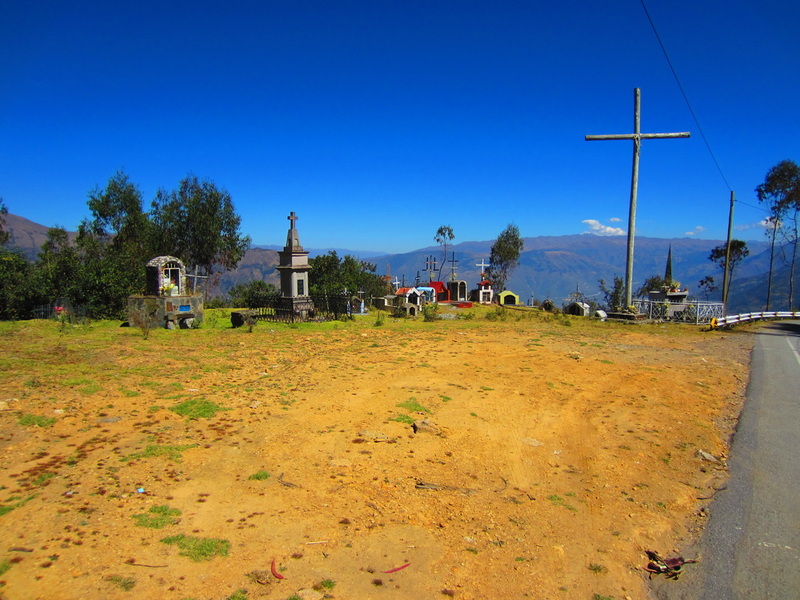 The vista below was so Peruvian, that of a checkerboard of crops and other land uses on terrain, sometimes so steep. The people in the mountains are never in a hurry, the women moving their animals along the road to feed for the day move at a pace set by their stock. There is a kind of aura about, when passing these scenes. An aura that you are drawn into, where you too move at a pace of the stock, till you are safely past them. These animals are very precious to these people, they often provide their only income and hence are very important to their well being. Other Peruanos know this. The animals are road savvy, very rarely running at the sight of approaching vehicles. Near the top, a wasp was on the side of the road, the couple in it were necking, whilst their sheep were scattered on the road and feeding alongside it. It was so reminiscent of innocent times in the past. On approaching Carahuasi, some gear was shed, due to the once again pleasant afternoon temperature. Once in town, bananas were enjoyed. So to were kebabs of beef, always with a potato stabbed on the end of the skewer. They are the ultimate street snack food for me, especially when there is spicy sauce to use. The banana vendor was asked about motels. He directed me to the Hotel Flor de Anis. No steps of course. I have tried to name all these accommodations as I journey, for other cyclists who don’t want to lug gear up and down stairs, often leaving gear exposed to theft. It is a very humble affair, my room was rectangular, light pink concrete walls, red concrete floor, no ensuite and a barred window, furniture within was a bed, table and chair and a basic bedside cabinet. Though roomy. It reminded me of a prison cell. Having spent a night locked up in Taupo, NZ, many years ago, following a day where the trout fishing conditions were conducive to spending most of the day in a bar with my fishing mate. He was originally locked up for being drunk, incharge of our car. Even though we were parked. In my state at the time, this displeased me greatly. I finally stumbled my way into the local police station, where upon persisting with the duty officers to see him. They threatened me with trespassing. Further persistence saw them release my friend and lock me up instead for trespassing on the police station. There I spent the night. Headlines in the local paper, read, “Drunk man invites police to arrest him”. At a later court appearance, infront of a visiting class of school children who found proceedings quite amusing. The verdict was a fine without conviction. I still remember the solicitor, in putting my case to the judge, saying “ Unable to fish, due to the inclement weather conditions, the defendant and his friend spent the greater part of the day in a hotel”. Oh, the experiences of life. a few corners whilst descending the range, so my time inside these four walls will also be restricted to one night. Actually, it is a perfect setup, plenty of room, the table for the stove and at 10 soles, which equates to $3.80 for the night, any complaints wouldbe rude and rightly fall on deaf ears. Upon arrival here and rolling the bike into the room, I was totally worn out, and exhausted, falling immediately to sleep on the bed for two hours, not even having unpacked a thing. Altitude and the climb had spent me. I was happily worn out. Everywhere in rural Peru, nothing is a problem, the people have a good sense of humour and are always friendly and helpful. Riding here is such a delight, even if the odd dog wears out his welcome in the middle of the road! 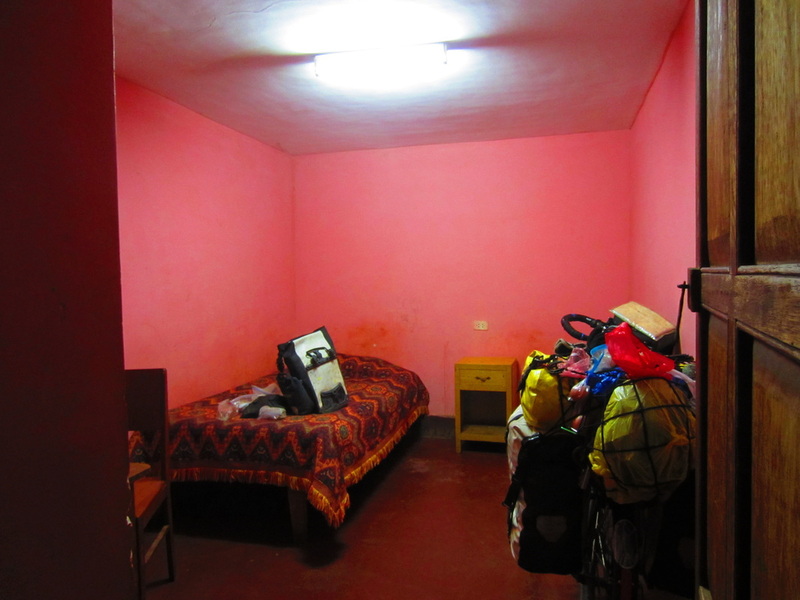 Abancay, The Peruanos are so obliging when it comes to putting my bike in my room. I wont have it any other way. A bad corner. Yesterday in the news a bus crashed with 18 dead due to brake failure. Great views from here, especially the road, heavy snow clad mountains were to the left of this vista.